Politics in Malaysia has become very interesting. People says that in the era of transition, there will be a lot of fake scenes, false stories, self-manufactured and concocted news to divert the attention of the people. There are still people in the corridor of power refuses to give up the power in their hands easily, not even without a fight. Do not forget that those in the corridor of power have been enjoying the privilege of being in power since more than 50 years ago. No logical person will give up this power easily without even fight, particularly when they are at the losing end even after one year they lost a portion of their powers to Pakatan Rakyat in some of the states in Malaysia. News of Teoh Beng Hock's death has plunged this nation to another sad state of affairs. We feel sad not only we lost a good friend and an good, young and idealistic comrade, but because his death reveals so much about this country, particularly the darker side of the country. Never in the history of this country that a death of a political aide caused so much controversies. Also never in the history of this country that a death of a political aide brought about some many spin-doctors who spin the stories in their own way to suit the taste of their political masters. Blogs and anonymous bloggers are mushrooming after the incident to desperately link Teoh's death with underworld activities. This is another attempt to "deflect public outrage at Teoh’s mysterious death at MACC and the refusal of the Prime Minister and the Cabinet to heed family and public demands to establish a Royal Commission of Inquiry to get to the bottom of the causes and circumstances of Teoh’s death", according to YB Lim Kit Siang. At first they tried to turn it into a racial issue, which is the easiest and conventional way of doing things but later they found that it does not work. In fact, it has become a disservice and burden to the PM's 1Malaysia concept. It has further proven useless when Pakatan Rakyat managed to put up a five-thousand strong public rally in Kelana Jaya. Though the victim is a Chinese but Pakatan Rakyat shows their unity with Teoh Beng Hock by turning up to support the cause to seek for justice for Beng Hock. Key Pakatan Rakyat Leaders were together in the public rally and even more heavy weights were present during the funeral in Semenyih. So, their racial tactics could not last long. They are almost running out of ideas until they have to spend about seven days later to turn the whole episode against DAP Selangor in specific and Pakatan Rakyat in general. It is seven full days that they could not do anything to salvage MACC. MACC was like a lame duck and everybody have a free shot at MACC. MACC was almost paralysed because of this. This comes together with so many other questions, like why MACC "released" Teoh Beng Hock at the wee hour of 3:45am? Why his handphone was not returned to him if he was ever "released"? So all of us read all sorts of stories in the blog targeting at DAP ADUNs. I believe the blog could be authored by more than one writers looking judging from the different writing styles, different level of English proficiency and several spelling errors (Wong Chuan How, Wong Chuan Chow etc). Already there are rumours that the blogs are operated by a group of employed cyber-troopers. They are tasked with the sole mission to rebut negative comments/blogspots against the authority in the Federal Government. Some of them even claimed that they are seeking justice for Teoh Beng Hock. I am wondering why they never mentioned about forming a Royal Commission of Inquiry to reveal the real truth to everybody? An RCI is the best platform to reveal and uncover everything. Moreover, if there are really some truths in their claims that the death of Teoh Beng Hock is related to underworld activities, do you think BN will easily let go an easy target to run down Pakatan Rakyat and DAP? They blog to seek justice for Teoh Beng Hock or to run down Pakatan Rakyat and Teoh Beng Hock? They seek justice for Teoh Beng Hock and yet they claimed Teoh Beng Hock siphoned off RM112 from the Selangor State Government? Yes, RM112 from the government coffer. That is why even the BN-controlled main stream newspapers and media are not interested in cooking up the stories. Simply because they themselves also find it difficult to believe. Of course, there are always some exceptions, i.e. Utusan Malaysia and UMNO Youth. LAPORAN POLIS TERHADAP ARTIKEL UTUSAN MALAYSIA “SELANGOR OH SELANGOR 2: APA ADA DALAM NOTEBOOK BENG HOCK? Saya ingin membuat laporan polis terhadap satu kenyataan yang dibuat oleh penulis artikel “Selangor Oh Selangor 2: Apa ada dalam notebook Beng Hock?” yang diterbitkan dalam Utusan Malaysia pada 22 Julai 2009 (Utusan Online) adalah bersifat spekulasi dan bertujuan untuk memesong siasatan pihak berkuasa terhadap kematian mendiang Teoh Beng Hock. Nama penulis artikel ini tidak diketahui. Jikalau penulis artikel ini mempunyai maklumat yang boleh membantu siasatan polis, maka beliau dan Utusan Malaysia harus tampil membantu polis menjalankan siasatan. Mereka harus menarik balik kenyataan ini dan meminta maaf kepada keluarga mendiang Teoh Beng Hock jikalau kenyataan mereka ini didapati tidak benar dan bersifat spekulasi. Saya meminta polis untuk menyiasat artikel dan penulis artikel ini serta Utusan Malaysia jikalau mereka mempunyai apa-apa maklumat lain yang berkaitan dengan kes kematian mendiang Teoh Beng Hock. Sekian laporan saya. 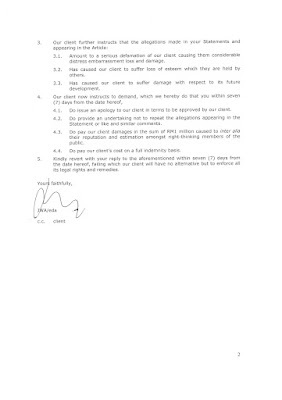 Legal notice from Sri Aman Development Sdn. Bhd. The Royal Commission of Inquiry (RIC) has finally been decided. At the same time, the coroner’s court was ordered to carry out an inquest. We do not yet know whether the two organisations will be complementary, overlapping or, possibly, contradictory. The differing views of the legal sector, the political sector and the civilians on this matter are worth examining. After all, everyone is hoping for a comprehensive panel of investigators to look into Teoh Beng Hock’s suspicious death case. The cabinet has decided to allow the coroner’s court to investigate the cause of his death. The RIC, on the other hand, was assigned to inspect whether the interrogation procedures of the Malaysia Anti-Corruption Commission (MACC) violated human rights. Najib explained that the RIC is not equipped to carry out a thorough investigation of the cause of Teoh’s death therefore the matter should go to the coroner’s court. However, the legal sector holds a different opinion. They believe that the responsibility and authority to investigate the cause of death should lie solely with the RIC. Of course, this leads us to the question of whether the investigation into Teoh’s cause of death or the MACC’s interrogation procedure is more important. At this point in time, what people really want to find out is the genuine reason for Teoh’s death. It is an absolute necessity that we solve this mystery before other intricately related issues can be disentangled. These issues include the MACC’s motives, practices and interrogation procedures. Therefore, in theory, the RIC’s most crucial task at hand is to carry out a thorough investigation on Teoh’s cause of death. Matters such as whether the MACC’s interrogation procedures have violated human rights or not should be second or even third on their priority list. The legal sector does not deem it wise to hand such a complicated case to the coroner’s court. (1) The coroner’s court is led by a magistrate. Will he have sufficient authority to summon trials, interrogate or to pass judgements for such a convoluted case? 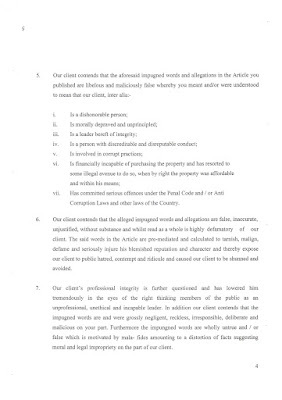 (2) The coroner’s court has a past record of indecisiveness and inconclusive judgements. They have numerous unsettled cases with unknown causes of deaths. Therefore, the legal sector remains suspicious of the cabinet’s decision to order an inquest by the coroner’s court. To hand an immense problem to a small court, and a secondary, less urgent matter to an important organization seems like an extreme waste of time and risk of reputation. It appears that we have put the horse before the cart. Now that the RIC has lost its true value and purpose it gives the impression of a panel which was assembled for the sake of assembling. The family of Teoh Beng Hock and the community were earnestly anticipating the formation of the RIC. This is because only a team of council members with such high rank can regain the confidence of the public that something can done. The terms of reference of the RIC have not been fixed. Therefore, there are still chances for the government, the legal sector and the political parties to further their discussions, and to reach a common consensus. Most importantly, they should not pass over this opportunity and they should not fail the people. It is certainly another proactive move from the Selangor Pakatan Rakyat State Government when it announces to have a state-wide internal audit to look into the spending of state allocation by members of legislative assembly. While most Pakatan Rakyat members of legislative assembly are prudent in spending the allocation, I welcome the decision of the state government which should be viewed as a positive move to ensure that the rakyat's money are not gone into the wrong hands. Meanwhile, I would like to urge the Federal Government on whether there are similar procedure in place to look into the spending of federal allocation by BN Members of Parliament, Parliamentary Coordinator etc. It appears that the Federal Government has always been secretive in reviewing the details on their parts of the allocation as you can read from here. SHAH ALAM: The Selangor Government has directed a state-wide internal audit on the spending of state allocation by members of legislative assembly. The internal audit will among others ensure that the spending of allocation comply with the procedures set by the State Government. “This is our way to assure the public that the accounting of the state coffers is continuously monitored,” said Tan Sri Abdul Khalid Ibrahim, The Menteri Besar Of Selangor. The internal audit team will also study the procedures involved with the intention for improvement. The auditing will begin as soon as possible at the Petaling District. A report by the internal audit team will be presented to the state within a month, after which, it will be made available to the public. On another issue, the state has also appointed leading human rights lawyer Malik Imtiaz Sarwar to act for the State Government in the inquest of Teoh Beng Hock. Malik will also be representing the state in the Royal Commission of Inquiry. The state is determined to ensure that the rights of the late Teoh, his family and other state officials who will be testifying at both proceedings are protected at all times. Pengarah SPRM Selangor, Ja’afar Mahad semalam mengadu bahawa siasatan kerap yang dijalankan oleh PDRM terhadap pegawai-pegawai SPRM telah mengganggu kerja-kerja siasatan anggota SPRM terhadap aduan penyalahgunaan peruntukan kawasan ADUN Pakatan Rakyat (PR). Saya terkejut dengan kenyataan yang dikeluarkan oleh Ja’afar Mahad ini kerana ini sekali lagi membuktikan sikap penafian SPRM dalam kes kematian Teoh Beng Hock dan siasatan terhadap ADUN-ADUN PR Selangor. Sehingga sekarang, SPRM masih belum memberitahu kami butir-butir yang terlibat dalam kes ini sehingga SPRM kelihatan sebagai “tembak soalan” dalam siasatan mereka tanpa sasaran tetap. Kami tidak tahu siapakah ADUN yang terlibat, program yang mana satu yang disyaki terlibat serta amaun yang terlibat dalam siasatan. Apa yang pasti, siasatan adalah disasarkan ke atas ADUN-ADUN Pakatan Rakyat. Daripada menjawap kemusykilan-kemusykilan yang tertimbul, SPRM memilih untuk membisu dan menafikan segala pertuduhan yang dilemparkan kepadanya tanpa sebab dan alasan yang kukuh. Adalah tidak mencukupi jikalau SPRM sekadar menjawap “semua kerja siasatan mengikut SOP yang ditetapkan”. Retorik-retorik sebegini langsung tidak dapat membantu rakyat jelata untuk berasa yakin bahawa SPRM ialah sebuah badan yang bebas dan tidak memilih bulu dalam menjalankan siasatannya. Malahan, SPRM tidak harus menegur siasatan yang dijalankan oleh PDRM terhadap mereka walaupun selama ini anggota-anggota PDRM yang menjadi sasaran siasatan SPRM. Saya tidak boleh berkata PDRM boleh menjalankan tugasnya dengan adil dan saksama tetapi jikalau proses siasatan telah bermula, maka SPRM perlu akur kepada proses ini dan bekerjasama dengan pihak-pihak yang tertentu untuk menjalankan siasatan. SPRM juga harus menggantung tugas pegawai-pegawai siasatan yang terlibat dalam kes ini kerana rakyat tidak yakin bahawa pegawai-pegawai ini dapat menjalankan tugas mereka dengan adil dan saksama tanpa sebarang penyalahgunaan kuasa sehingga nama mereka dibersihkan oleh PDRM dan Suruhanjaya Siasatan DiRaja. Seperti badan-badan kerajaan yang lain, SPRM harus bersikap rendah diri dan menerima teguran baik untuk kebaikan bersama. Sindrom penafian yang masih jelas kelihatan dalam SPRM ini hanya akan menjadikan imej SPRM terus tercalar. The outrageous claims made in a blog article alleging misuse of state allocations by two of us is a malicious attempt to defame members of the Selangor state Exco members and to mislead the public and to discredit the state leadership. It is a fact that all such allocations are approved and paid by the Land Office. These payments are usually approved and signed for by the Assistant District Officer on behalf of the District Officer. Payment is then made to the approved recipients. In the process, all payments must be properly supported by documents. Thus in these cases, all payments are fully supported by vouchers, receipts, invoices and photographic evidence of the programme or the project concerned. This system has been in place for many years and was handed down from previous Barisan Nasional administrations. 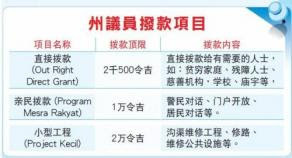 Since early this year, full details of all such payments had been posted on Ronnie Liu's blog with full details such as the programme dates, the amounts and cheque numbers, and the relevant receipts. The allegations contained in the blog article contain many flaws and mistakes that indicate the article was posted with malicious intent and with no regard for the truth. 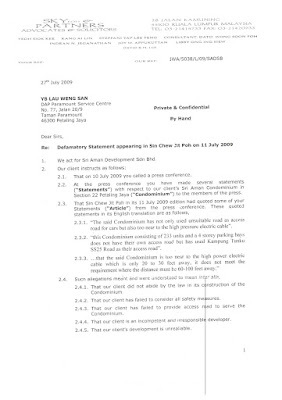 Chief of these is the allegation that a recipient of the funds, Wong Chuan How is a contractor and reportedly was a major beneficiary of projects and contracts award by Ronnie Liu. Wong is in fact a special assistant to Liu and also a Sepang councilor. Some cheques were made out to him as he handled miscellaneous payments in connection with some projects and programmes. These payments are also documented and supported with receipts and vouchers which may be inspected if necessary. Some of the programmes listed relate to the periods before March 2008, so how can two of us have had access to state allocation funds then when they had not been elected as assemblymen yet? Some of the programmes and projects listed in the article are fictitious and non-existent. For example, the allegation that funds were disbursed to buy hampers for village chiefs in Seberang Perai is far fetched as the Land Office in Selangor would never approve funds for programmes outside the constituency let alone outside the state. The allegations that DAP takes a commission from all the payments is also ludicrous as the amounts are paid in full to the recipients and there has been no complaint on this to date. Besides, where is the proof of this? In making payment, the Land Office verifies the expenditures and would only authorise payments when there is proper supporting documentation. The writer of the article has to date not produced any proof of his allegations. Why are the DAP Exco members singled out for this allegations? Is there a political ploy afoot to discredit the state government? We demand that the offending blog article be withdrawn immediately and an apology be tendered to both of us, failing which further action deemed fit should be taken. Perhaps we should remind the public that the reports and complaints that state allocations to Barisan Nasional assemblymen in 2008 were exhausted within the first two months of the year, including a case where an assemblyman spent RM220,000 in a day! DAP has set up a trust fund specifically to look after the financial needs of the unborn child of the late Sdr Teoh Beng Hock. We target to raise at least RM500,000 to 600,000 and the fund shall be used for his living, medical, education and other needs. The trustees to the account are Sdri Teo Nie Ching, MP for Serdang who acts on behalf o the party, and Sdr Teoh's wife, Soh Cher Wei. This is the ONLY trust fund set up for the welfare of Sdr Teoh’s unborn child. The family has not given consent for the setting up of any other fund for this purpose. This fund is being launched at tonight's memorial at KL Selangor Chinese Assembly Hall and we'll keep the public updated on its progress. On behalf of the DAP and Sdr Teoh's family, we'd like to express our thanks to all generous donors. DAP Selangor will be carrying a state wide candle light vigil and memorial session to seek justice for the late Teoh Beng Hock on Friday 24th July 2009, 8:30pm. All DAP members, branch leaders, councilors, State Assemblypersons (ADUNs) and Members-of-Parliament (MPs) in Selangor will organize or jointly organize such event in solidarity for the late Teoh Beng Hock, who passed away mysteriously last Thursday. We welcome members of the public and supporters to attend and give full support to urge the Federal Government to form a full-force Royal Commission of Inquiry to investigate not only the interrogation methods by the Malaysian Anti-Corruption Commission (MACC) but also to investigate the cause of the sudden death of Teoh Beng Hock. 1. Candle light vigil by DAP Kuala Langat & DAPSY Kuala Langat at Dewan Orang Ramai Jenjarom, Kuala Langat. 2. Candle light vigil by DAP Pekan Banting branch at DAP Pekan Banting Branch service centre, No. 46, Jalan Delima 28, Taman Delima, 32700 Banting, Selangor. 3. Candle light vigil by the Office of Teratai Assemblyperson at Dewan Taman Putra, Pandan Indah. 4. Candle light vigil by DAP Tanjong Sepat branch at Councilor Wong Kim Loon’s office, No. 65, Jalan Pelangi 14, Taman Pelangi, 42800 Tanjung Sepat, Selangor. 5. Candle light vigil by DAP Kajang Baru branch at DAP Kajang Baru Branch, No. 7-1, Jalan Kajang Mewah 4, Taman Kajang Mewah, 43000 Kajang, Selangor. 6. Candle light vigil by DAP Balakong New Village Branch at DAP Kg. Baru Balakong Branch Office, Balakong. 7. Candle light vigil by DAP Pandamaran at Councilor Tee Boon Hock’s office, No. 12A-01-1, Lorong Batu Nilam 1D, Bandar Bukit Tinggi, 42000 Klang. 8. Candle light vigil by DAP Kinrara at Kinrara ADUN’s office, L-02-01, Pusat Perniagaan Kinrara, Psn. Kinrara Seksyen 3, Taman Kinrara, 47100 Puchong, Selangor. 9. Candle light vigil and memorial session by DAP Kampung Tunku Assemblyman’s office at MBPJ Community Hall, Jalan SS3/14, Petaling Jaya. Should PR Assemblypersons stop giving aid? For the pass few weeks, several organizations, associations and poor people had come to my office seeking for assistance. Most of the assistances they seek are monetary assistances. As ruling party assemblyman, I have the privilege to offer my help utilising my constituency development fund. It is also the same fund that makes all Pakatan Rakyat Assemblypersons in Selangor placed under the MACC’s selective investigation. Before the death of Teoh Beng Hock, it was reported that recipients of such contributions were held up by MACC for investigations as “witnesses”. They were repeatedly asked whether they have received the amount or not. As for suppliers and contractors, they were also called up by the MACC to confirm if they have really supplied the said items in the event or not. Contractors of small engineering projects were also called up to provide details of the jobs they had done for the assemblypersons. Most of those who were called up by the MACC could not understand why MACC has to repeatedly ask them the same questions. While there are also contractors who are cornered by the MACC interrogators to make false statement that they did not supply the said item, Tan Boon Hua is a very classical example. It seems like receiving helps and financial assistances to temples, organizations, poor families from Pakatan Rakyat assemblypersons nowadays is soon becoming a messy affairs to the recipients and the general public. Should we, Pakatan Rakyat assemblypersons, stop the practice temporarily? I now understand and support Penang Chief Minister Lim Guan Eng's decision to boycott the NST group of newspapers and stopped the state government's subscription of the papers. It is simply beyond an intelligent person's comprehension how an editor could arrive at the conclusion that the protest against the high-handed methods of the MACC is a challenge to the Malays. Only an immature, insecure and not too intelligent person can look at the Teoh Beng Hock case from a racial perspective. OneMalaysia? Nonsense! If we have people in positions of power and influence with such racialist mentality, there can never be 1Malaysia. I have just retired as a journalist after nearly 35 years in the profession, and during my years as a reporter, socio-political analyst and editor, I have identified five types of journalists in the media community. First, there are the EEs -- Editorial Eunuchs, who take orders from their political emperors and write and spin stories to promote the emperor's cause. These political appointees are usually in top and senior positions, not because they are good journalists or great writers, but because of their connection to powerful political godfathers. They are first class cronies. Many are ghost writers for their political masters. Some have become millionaires. Secondly, there are the PPs -- Press Prositutes, who have sold their souls and principles to gain favours and privileges from their political and/or business clients. They will write what pleases their political masters. The amount of hampers and gifts they receive during festive seasons is perhaps a good indication of their rising status in their media organisation. (Perhaps the MACC should consider looking at this practice of giving editors hambers and gifts during festive seasons). Thirdly, there are the MMs -- Media Marionettes, the puppets who have no brains but are used and abused by opportunists to advance their own political or business agenda. They usually feed such journalists with twisted information and deceive these gullible writers to propogate their schemes of things. Our education system has produced many such gullible, unthinking, uncritical, and dumb people, and some of them are found in the media organisations. Fourth, there are the JJs -- Junket Journalists, those who will write anything for the sponsors of their overseas trips. Finally, there are the WWs -- Wise Writers, the rare breed who know how to survive through the controlled press situation and get their honest views into print without rousing the suspicion of their media bosses, who are usually political cronies. There are very few such honest writers with integrity and principles, and they are usually not in positions of power. How can we expect to have OneMalaysia when we do not really have a free and credible press? If our prime minister is truly sincere in wanting to take take the country to greater height as 1Malaysia, then the first thing he needs to do is to liberate the press by abolishing the oppressive legal restraints such as the Printing Presses and Publications Act, the Internal Security Act, the Official Secrets Act, etc. and enact a Freedom of Information Act. Then, he must revamp the whole system of administration to get rid of those known to be corrupt, racist, and incompetent. Most importantly, there must a reform in the judiciary, enforcement agencies, the election commission, etc. He must also reinstate local council elections. 1Malaysia? It will remain a slogan and a dream if the current federal government does not take concrete actions to reform the whole political and administrative environment in the country. If the Barisan Nasional administration is unable to bring about such reforms, then we must throw it out at the next general election. MACC officers said that Teoh was released at 3:45am on 16th July 2009. If it is so, MACC should have returned Teoh's handphone to him. But why the police can recover the handphone from MACC officers? It just shows that Teoh was never released from MACC's investigation at all. Can we trust MACC's statement anymore? With regard to the Deputy Prime Minister Tan Sri Muhyiddin Yassin’s statement that a cabinet meeting will he held on Wednesday to discuss whether to establish a Royal Commission of Inquiry (RCI) to investigate Teoh Beng Hock’s death, Democratic Action Party insist that they not only do that, but DAP also stresses that the RCI that is established must include the following traits: immediacy, neutrality and entirety, in order to reveal the truth for the sake of Beng Hock and his family. Immediacy: Teoh Beng Hock will undergo his burial ceremony soon. Precious time for investigation purposes is fading. By coincident, this coming Wednesday is the “seventh day” of Beng Hock’s passing. The Barisan National government should announce the establishment of the Royal Commission on that day at the very least, in order to bring some comfort to Beng Hock’s family and relatives on the “seventh day” of his passing. Neutrality: At least half of the Royal Commission’s members should be recommended and appointed by Pakatan Rakyat. Teoh Beng Hock was a DAP member, as well as a member of the Selangor PR government. Thus it is logical and appropriate for PR to have the right to recommend and appoint half of the members of RCI. Only by doing this, then will the public believe that the RCI is independent, non-partisan and credible. Entirety: Other than investigating the cause of death of Teoh Beng Hock, the Terms of Reference must include a total re-evaluation of Malaysian Anti-Corruption Commission’s (MACC) power and standard operating procedures (SOP). MACC should not be allowed to collect evidence by threatening the witnesses nor interrogate witnesses after 7.30 p.m. MACC must undergo a total reformation, in order to ensure that MACC is not a tool of BN government and use to intimidate and control the people. The establishment of the RCI is only the first step towards revealing the truth of Teoh Beng Hock’s tragic death. DAP will scrutinise the establishment of the RCI ensure that it maintains its consistency in its performance and responsibility, so that similar incident will not be repeated. "Stop talking. Start acting. It is now time to take to the streets. It will be too long to wait for the ballot box. We must vote now. And we must vote with our feet. We have forgotten who the enemy is. The enemy is not each other. The enemy is Barisan Nasional and the stooges of Barisan Nasional that include PDRM, MACC, SPR, the AG Chambers and the judiciary. So let’s stop fighting each other. And let’s start fighting the real enemy. And stop dreaming of the ballot box. Vote today. Vote with your feet. And vote in large numbers. ‘Election Day’ starts tomorrow. And the ‘election timetable’ is as follows. Make sure you come out to ‘vote’." * 21/7 (Tuesday, 8pm) - Public Forum: Justice For Beng Hock, Reforming Malaysia @ Jln Utama, P.Pinang. When exactly Teoh Beng Hock was released? Who are the investigating officers involved in Sdr Teoh Beng Hock's case? What are the names of the investigating officers, especially those who are involved during the interrogation process? Will the MACC immediately suspend the service of the investigating officers in this case pending a full inquiry into this incident? Will the Federal Government institute an independent Royal Commission of Enquiry into this matter? What is the basis of the investigation as MACC is planning to investigate on all Pakatan Rakyat ADUNs in Selangor, which will be exhausting valuable public resources into petty and unnecessary investigations while corruption cases involving billions of ringgit are left idle? Is MACC going on a "fishing expedition"? Who made the report against Pakatan Rakyat ADUNs in Selangor? Why is the rush for an overnight investigation? Is MACC investigating side issues? Why issues not related to the allocation, ie. Mesra Usia Emas is also questioned? The Malaysian Anti-Corruption Commission has accelerated its investigation on all 36 Pakatan representatives in Selangor including Menteri Besar Khalid Ibrahim, claimed Kampung Tunku assemblyperson Lau Weng San. According to Lau, whose office was raided by the commission yesterday, the MACC officers have now taken all documents pertaining to Pakatan's community programmes at Gombak's land office and will start investigating from one area to another. "They (MACC officers) also told me that they will investigate other reps, and not just the seven (as mentioned by state exco Teresa Kok)," Lau (left) told reporters at MACC Selangor headquarters in Shah Alam. It was reported previously that seven Pakatan state reps in the state were investigated by the commission in relation to the use of state funds in their respective constituencies. This was followed by several raids at Lau and state exco and Sri Kembangan assemblyperson Ean Yong Hian Wah's offices. According to Lau, MACC is on a "fishing expedition" to see whether there were any misuse of the funds. "They wanted to ensure that all the community programmes that we organised thus far are legitimate and people were attending them. "They (the MACC) apparently also wanted to make sure that the elected reps do not easily claim money from the land office (which is in charge of the funds) for organising the events," Lau said. But Lau assured that all Pakatan representatives have been prudent in their spending as they have strictly followed the land office's rules when it comes to claims. "It is diffcult to get any claims from the land office because they normally require photos relating to our community events as evidence," he said. "But I do hope MACC can give an explanation as to why they appear so unsatisfied with our allocations," said Lau. Lau was initially called up by the MACC to get his statements recorded today, but his appointment has been postponed to a later date. He, instead, lodged a corruption report against former BN assemblyperson for Kampung Tunku, Wong Sai Hou, for allegedly misusing the state funds amounting RM500,000 within three months before the March general election last year. According to him, Wong had spent up to RM30,000 a day for different functions in his constituency. Showing a list events that he obtained from a land office, he indicated that the events organised by the previous administration were mostly "big events". "And each of the event, they would spend exactly RM10,000, which is the maximum amount that can be claimed from the land office," said Lau. He hoped the MACC could accelerate their investigation on the BN representative as fast as its investigations on the Pakatan reps. Similar complaints had been lodged by Pakatan reps before this, where BN assemblypersons had allegedly spent 90.6 percent of the total state allocations within the first two months of this year, amounting to RM27 million. However, an investigation has yet to be carried out by the commission. Bagi pertuduhan pertama, Y.B. Dato’ Seri Dr. Mohamad Khir bin Toyo dikenakan hukuman penggantungan daripada perkhidmatan Dewan selama satu (1) tahun dan dipotong semua elaun serta kemudahan bulanan selama satu (1) tahun. Bagi pertuduhan ke 2, ke 3 dan ke 4, Y.B. Dato’ Seri Dr. Mohamad Khir bin Toyo dikenakan hukuman penggantungan daripada perkhidmatan Dewan selama satu (1) tahun dan dipotong semua elaun serta kemudahan bulanan selama satu (1) tahun. Jawatankuasa ini juga memutuskan bahawa keempat-empat hukuman yang dijatuhkan ke atas Y.B. Dato’ Seri Dr. Mohamad Khir bin Toyo hendaklah dijalankan serentak. Bagi Y.B. Dato’ Hj. Warno bin Dogol (ADUN Sabak), penggantungan daripada perkhidmatan Dewan selama enam (6) bulan dan dipotong semua elaun serta kemudahan bulanan selama enam (6) bulan. Bagi Y.B. Tuan Mohd Isa bin Abu Kasim (ADUN Batang Kali), penggantungan daripada perkhidmatan Dewan selama enam (6) bulan dan dipotong semua elaun serta kemudahan bulanan selama enam (6) bulan. Bagi Y.B. Dato’ Marsum bin Paing (ADUN Dengkil), penggantungan daripada perkhidmatan Dewan selama enam (6) bulan dan dipotong semua elaun serta kemudahan bulanan selama enam (6) bulan. Bagi YB Dato’ Hj. Mohamed Idris bin Hj. Abu Bakar (ADUN Hulu Bernam), penggantungan daripada perkhidmatan Dewan selama enam (6) bulan dan dipotong semua elaun serta kemudahan bulanan selama enam (6) bulan. Kampung Tunku ingin menegaskan bahawa hukuman yang dikena ke atas kelima-lima orang ADUN ini adalah berbeza dengan hukuman-hukuman yang dikenakan ke atas ADUN-ADUN dan Ahli-ahli Parlimen Pakatan Rakyat pada masa yang lalu. Saya telah meneliti Penyata Jawatankuasa Hak Dan Kebebasan Dewan Negeri Selangor ini dan teleh mengetahui bahawa mesyuarat Jawatankuasa telah diadakan dan satu sesi pendengaran telah dipanggil untuk kelima-lima orang ADUN yang terlibat untuk datang membela diri sendiri. Kesemua ADUN ini telah diwakili oleh tujuh orang peguam dan mereka telah mengemukakan bantahan. Kemudian kesemua ADUN yang terlibat itu mengambil keputusan untuk tidak membela diri. Berbanding dengan apa yang berlaku ke atas wakil rakyat Pakatan Rakyat yang lalu, hukuman yang dikenakan ke atas mereka selalunya dilakukan dengan secara tergesa-gesa, di mana wakil rakyat yang dihukum itu selalunya tidak diberi peluang yang mencukupi untuk menghadirkan diri ke Jawatankuasa Hak dan Kebebasan dan membela diri sendiri. Bagi kali ini, peluang yang seluas-luasnya telah diberi kepada mereka tetapi apa yang mengecewakan ialah kesemua ADUN ini memilih untuk tidak membela diri. Malahan semasa pengundian dibuat, wakil induk BN di dalam Jawatankuasa Hak dan Kebebasan, YB Kuala Kubu Baru telah memilih untuk berkecuali semasa membuat keputusan dalam tujuh daripada lapan pertuduhan. Ini turut menunjukkan bahawa ADUN daripada BN sendiri pun tidak sanggup mengambil keputusan untuk menolak pertuduhan ini. Hukuman-hukuman yang diluluskan oleh Jawatankuasa Hak dan Kebebasan Dewan Negeri Selangor ini adalah berpatutan. Seperti yang dipesan oleh Tuanku Sultan Selangor semasa majlis santapan ulang tahun ke-50 Dewan Negeri Selangor, martabat dan keutuhan Dewan Negeri Selangor perlulah dijunjung setiap masa. Setiap anggota Dewan perlulah menjalankan tugas masing-masing mengikut peruntukan dalam Undang-undang Tubuh Negeri Selangor 1959 dan Peraturan-peraturan Tetap Dewan Negeri Selangor. 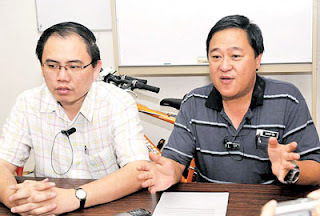 SHAH ALAM (July 13, 2009) : Former Selangor Mentri Besar Datuk Seri Dr Mohd Khir Toyo has filed a notice of action against Kampung Tunku state assemblyman Lau Weng San, seeking RM2 million in damages and a retraction of an article posted on the latter's blog about his luxury home, dubbed Istana Khir. The article concerned is a copy of Lau's emergency motion to debate the issue during the ongoing Selangor State Assembly sitting. Lau, in his motion, had questioned how the Sungai Panjang assemblyman could afford such an expensive property, which sits on two lots of land on Jalan Suasa 7/1L in Shah Alam, costing a total of RM3.8 million. He also said the matter should be investigated to see if there were elements of corruption and abuse of power on the part of the former Mentri Besar. Mohd Khir said on July 6 that he had obtained a RM3.5 million loan to buy the property but Sekinchan assemblyman Ng Suee Lim, who had brought the matter to the media's attention, estimates that the Balinese-themed house cost RM24 million. 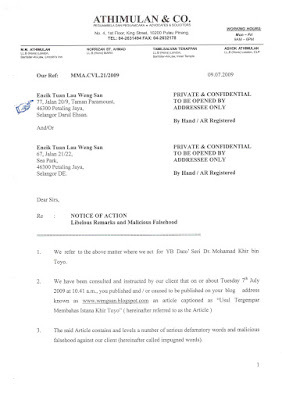 In the notice dated July 9, filed by his lawyers Athimulan and Company, Mohd Khir is seeking a retraction of the article from Lau’s blog, a full and complete apology to be published via a newspaper ad in a publication of Mohd Khir’s choice, a written undertaking not to repeat or publish the said or similar words and RM20 million for damage to his reputation, financial loss and distress caused by the allegations. Earlier during the question and answer session at the Dewan, Lau took the opportunity to take a jibe at Mohd Khir by asking about the status of the mulit-million ringgit Exco village built during the latter’s administration of the state. In questioning Housing, Building Development and Squatters executive councillor Iskandar A.Samad about how much the property cost, he said: "I would like to know this to be able to gauge the property prices in Shah Alam, especially since a former Mentri Besar claims that his loan for a property in Section 7 cost only RM3.5 million." "Even former prime minister Tun Dr Mahathir Mohamad, who owns a RM1 million home, has expressed doubts that the property cost only that much," he said. Meanwhile speaking to reporters after being expelled from the Dewan Mohd Khir said he was willing to forego the RM20 million demand from Lau if he was willing to apologise. "I am not such a bad person, but I need to clear my name and am not so interested in the RM20 million," he said. If I win the RM20million I will use it to take all of you here on a holiday, because I do not want the money for myself," he added. Lau on the other hand told reporters that he would not be retracting the article on the blog and was prepared to face Mohd Khir in court. Laporan yang dikeluarkan oleh SELCAT perlulah diambil dan dipandang berat oleh semua pihak bagaimana urus tadbir korporat yang tidak mantap, tidak profesional dan tidak jujur boleh memudaratkan kewangan negeri. Laporan ini juga telah mendedahkan kelemahan-kelemahan dari segi urus tadbir korporat oleh syarikat-syarikat GLC di Selangor di mana keuntungan syarikat-syarikat dibazirkan oleh pentadbiran kerajaan negeri yang lepas sewenang-wenangnya sehinagga wang yang sepatutnya digunakan untuk memperbaiki taraf hidup rakyat negeri Selangor dibelanjakan untuk kepentingan dan keselesaan diri sendiri. CSR ditakrifkan sebagai tindakan proaktif sesebuah korporat itu untuk menjaga kepentingan awam dengan menggalakkan pembangunan masyarakat, dan secara sukarela menghapuskan segala praktis yang akan merosakkan kepentingan awam. Ini adalah takrifan secara am tetapi pelaksanaan dan pendekatan yang digunakan oleh syarikat-syarikat GLC dalam kes berhubungan BALKIS jelas berbeza dan terpesong daripada takrifan am ini sehingga GLC-GLC ini digelar sebagai “mesin ATM” kepada BALKIS. Jumlah besar sumbangan yang diberi oleh kerajaan negeri dan anak-anak syarikat kerajaan negeri ialah RM7.3juta dari tahun 2002 hingga 2007. Rata-rata anak-anak syarikat kerajaan negeri tidak mempunyai dasar yang jelas dalam melaksanakan tugas-tugas CSR. Satu contoh yang baik ialah PNSB, di mana PNSB memperuntukkan secara tetap setiap tahun RM1juta kepada BALKIS. Ketua Pegawai Eksekutif PNSB Datin Hajah Khairiyah bt Abu Hassan pernah mengaku bahawa PNSB tetap akan member sumbangan kepada BALKIS biarpun aktiviti-aktiviti BALKIS itu hanya menguntungkan sekumpulan individu sahaja. Malahan PNSB pernah memberi sumbangan RM100,000 secara tunai kepada BALKIS. Lawatan ke Disneyland turut dibiayai oleh PNSB dan ianya seolah-olah menjadi lawatan peribadi keluarga mantan Menteri Besar. Juga difahamkan daripada laporan hansard sesi pendengaran awam bahawa mantan Menteri Besar ADUN Sungai Panjang tidak pernah berjumpa dan berbincang dengan pakar-pakar teknikal di Disneyland, pengurusan dan pembinaan Taman Tema Disneyland serta laporan-laporan kejuruteraan. Laporan daripada SELCAT ini juga mendedahkan bagaimana agensi-agensi kerajaan boleh dimanipulasikan oleh golongan-golongan tertentu sehingga mereka tidak dapat berfungsi dengan adil, saksama dan tidak berbelah bagi. Kampung Tunku terkilan dengan betapa cepat Jabatan Pendaftaran Pertubuhan Negeri Selangor boleh membenarkan pembubaran BALKIS dengan begitu cepat, iaitu dalam masa kurang daripada sebulan. Pengajaran yang kita dapat memperolehi daripada insiden ini ialah: Kerajaan perlu menetapkan satu sistem pelaksanaan CSR dengan profesional dengan garis panduan dan dasar yang jelas. CSR bukan hanya setakat memberi wang, tetapi turut membantu menaik taraf golongan yang daif dan fakir miskin supaya mereka boleh berdikari. Pendidikan merupakan satu langkah penting dalam melaksanakan tanggungjawab CSR. Syarikat-syarikat luar negara masing-masing mempunyai cara-cara pelaksanaan CSR yang lebih mantap dan profesional. Contohnya Shell melaksanakan CSRnya yang lebih ditumpukan kepada kajian terhadap perubahan cuaca serta galakan terhadap pembelajaran dan pendidikan di dunia ketiga sebagai sasaran utama CSRnya di dunia ketiga. Pelaksanaan ini melibatkan penajaan program-program penyelidikan di universiti-universiti tertentu serta program-program biasiswa dalam bidang yang boleh membantu manusia mengatasi masalah-masalah alam sekitar. • Penilaian yang dilaksanakan oleh sesebuah syarikat itu terhadap pencapaian CSRnya dalam sesuatu tahun kewangan itu serta sasaran yang bakal dicapai pada masa-masa hadapan. Oleh itu, saya mencadang kepada kerajaan untuk meneliti perkara ini secepat mungkin sebagai tambahan kepada cadangan dan saranan yang disyorkan dalam Penyata ini supaya GLC-GLC Kerajaan Selangor dapat melaksanakan tanggungjawab-tanggungjawab CSR mereka dengan lebih cekap dan mantap. Caruman kepada Kumpulan Wang Pembangunan Negeri di bawah kepala B06 sebanyak RM77 juta telah diperuntukkan dalam Bajet Tambahan Peruntukan Pembangunan Tahun 2009. Daripada peruntukan ini, sebanyak RM477,000 telah diperuntukkan untuk melaksanakan pelbagai projek negeri khas di bawah kepala P01, butiran projek 26001 untuk Jawatankuasa Tetap Alam Sekitar dan Projek Pengindahan Sungai Klang. Saya ingin bertanya tentang butiran dalam projek-projek khas ini kerana ianya tidak diterangkan dengan jelas dalam kertas-kertas yang disampaikan kepada kita. Beberapa projek naiktaraf jalan telah dilakukan di bawah Jabatan Kerja Raya yang telah dimasukkan dalam Tambahan Peruntukan Pembangunan kali ini oleh JKR. Walaupun begitu, saya mendapati beberapa projek dilaksanakan pada tahun 2007 dan 2008. Sepatutunya pembayaran kepada projek-projek ini harus dimasukkan dalam belanjawan 2007 dan 2008 dan bukannya dibawa ke dalam Bajet Tambahan Peruntukan Pembangunan. 1. Projek melebar dan memperkukuhkan Jalan Batu 7, Sempadan Sijangkang, Kuala Langat yang bermula pada 5 Oktober 2007 dan siap pada 27 Disember 2007. 2. Cadangan menaik taraf jalan dan longkang di Jalan Rinching Tengah, Rinching Hilir, Rinching Hulu dan jalan-jalan lain berkaitan yang bermula pada 1 April 2008 dan siap pada 21 Julai 2008. 4. Membaik pulih dan menurap semula Jalan B35 dari Simpang 3 Ijok ke Kampung Bukit Badong yang bermula pada 12 April 2007 dan siap pada 12 Mac 2008. Saya meminta rakan-rakan semua untuk meneliti tarikh projek yang ke-3 dan yang ke-4 di mana tarikh bermula kedua-dua projek ini terletak pada waktu berkempen pilihanraya umum ke-12 dan pilihanraya kecil Ijok pada tahun 2007, iaitu projek “Membina dan menyiapkan jejantas di SRA Bukit Badong” dan “Membaik pulih dan menurap semula Jalan B35 dari Simpang 3 Ijok ke Kampung Bukit Badong”, masing-masing menelan kos RM920,400 dan RM2.7 juta. Apa yang mengkhuatiri saya ialah kedua-dua projek ini ialah projek mi segera yang memang merupakan favourite Barisan Nasional semasa berkempen. Kalau kedua-dua projek ini bukan projek mi segera, mengapa kedua-dua projek ini tidak dapat dimasukkan ke dalam bajet 2007, bajet 2008 atau tambahan bajet pembangunan 2008? Berapa banyak projek mi segera yang dilakukan oleh kerajaan negeri yang lalu yang masih belum dibuat bayarannya? Adalah amat jelas bahawa projek-projek ini hanya bertujuan untuk mengaut kepentingan politk bagi Barisan Nasional. Saya amat terkilan kerana wang yang sebegitu banyak dibelanjakan tanpa perancangan yang betul. Oleh itu saya menggesa rakan-rakan sekalian daripada Pakatan Rakyat supaya mengikis mentaliti projek mi segera ini. Keutuhan kerajaan bergantung kepada dasar dan pelaksanaannya, bukan bergantung kepada berapa banyak projek mi segera yang dapat disediakan semasa menghadapi pilihanraya sama ada yang umum atau yang kecil. Khir Toyo ejected from the Selangor Legislative Assembly (DUN) when he called the Speaker, YB Teng Chang Khim, as bias. He was offered to apologize and withdraw his statement a few times but he refused. The Spaker made a decision to eject him from the Assembly. All other BN assemblymen also left together with him. Earlier, DAP Assemblyman for Sekinchan Ng Suee Lim had requested to the Speaker under Standing Order 87 of whether it is against the privilege provisions of the House for any lawyer to serve any legal notice to any Assemblyman in the Assembly. The Speaker has replied under Standing Order 88 which provides that all matters not specifically provided in the Standing Order and all questions related to the detailed working of these Orders shall be regulated in such manner, not inconsistent with these Orders, as Mr. Speaker may from time to time direct; and in giving any such direction Mr Speaker shall have regard to the usage of Commonwealth Parliamentary practice so far as such usages can be applied to the proceedings of the Assembly. The Speaker then proceed to reply that such action of serving legal notice to any Assemblyman in the Assembly is against the privilege provisions of the House. Khir Toyo, who is also the Assemblyman of Sungai Panjang disagreed with the Speaker and refused to tender his apology when he called the Speaker as "bias". Khir Toyo was unable to make any reference to the Standing Order when he disagreed with the Speaker. 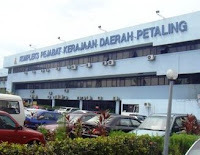 Petaling Land Office will move to Paya Jeras - Confirmed! Yes, it is confirmed, The Petaling Land and District Office will have to move to Paya Jeras. Else, the State Government under Pakatan Rakyat will have to compensate the private company RM24.6 million for the land cost and the building cost of the new building in Paya Jeras. It is unavoidable. The previous State Government has signed agreement with Gapurna Builders Sdn. Bhd. 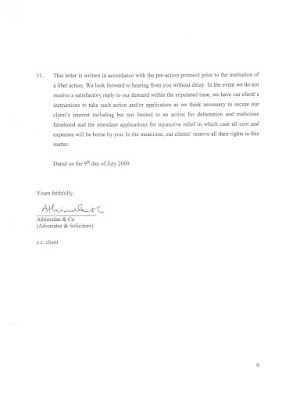 on 22nd September 2006 when previous state Exco decided on 12th May 2004 to enter into an agreement with Gapurna Builders to construct an all new office for Petaling Land Office on a piece of land sized 11.19 acre in Paya Jeras in exchange for the current location of the Land Office and government servants quarters sized 4.14 acre in Subang Jaya. According to the agreement, Gapurna Builders have to construct the new building for Petaling Land Office before the State Government handing over the land of the old land Office to Gapurna Builders. The State Government has received a number of complaints not only from general public but also civil servants working with Petaling Land Office as the new premise located to far from their homes. This is certainly another example how rushed decision made in the past affect all of us now. Can you suggest what the State Government can do to rectify the problems? 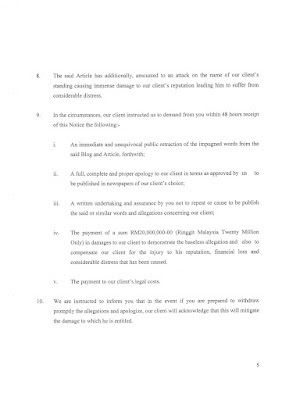 Khir Toyo's legal notice to LWS! Selangor tidak dapat mengelakkan dirinya daripada terjejas dengan kemerosotan ekonomi yang melanda dunia sekarang. Mengikut fakta yang saya perolehi pelaburan asing di seluruh negara merosot melebih 90% berbanding dengan tempoh lima bulan pertama tahun lalu, iaitu daripada RM46.1 bilion jatuh ke RM4.2 bilion. Fenomena ini berlaku di merata-rata tempat termasuk di Selangor. Walaupun begitu, saya percaya jikalau prinsip-prinsip seperti ketelusan, keterbukaan dan bermerit diteruskan, kutipan hasil dan pelaburan yang kita dapat kumpulkan pasti akan bertambah kerana rakyat akan mempunyai keyakinan terhadap kerajaan Selangor, bahawa cukai dan hasil yang mereka bayar akan digunakan sebaik-baiknya untuk rakyat Selangor. Mereka akan melihat membayar cukai kepada kerajaan Selangor adalah untuk membantu mereka sendiri. 1. Pemberian bantuan kepada sekolah-sekolah SJKT, SJKC, SAR serta Sekolah Menengah Persendirian Cina perlu dikekalkan untuk tahun yang akan datang. a. Think Out Of The Box – Adakah kerajaan Selangor boleh menawarkan biasiswa kepada murid-murid dan pelajar-pelajar sekolah yang menunjukkan prestasi akademik dan ko-kurikulum yang cemerlang? Jikalau boleh saya ingin bercadang supaya Yayasan Selangor diberi peluang untuk memainkan peranaan yang lebih penting dalam membangunkan modal insan di Selangor dengan peruntukan yang lebih banyak diberi kepada Yayasan Selangor pada masa depan. 2. Program SPIES dan PTRS perlu dirombak semula mengikut kesesuaian kawasan masing-masing. Saya lebih rela jikalau peruntukan ini dapat digunakan untuk memperkasakan perpustakaan-perpustakaan awam yang ada di Selangor di bawah PPAS, dan juga perpustakaan-perpustakaan yang terletak di bawah PBT. RM35 juta diperuntukkan pada tahun 2009 untuk tujuan ini dan saya menggesa supaya tulisan-tulisan atau karya-karya dalam pelbagai bentuk judul dan bahasa untuk memperkayakan simpanan buku dalam perpustakaan negeri kita supaya ianya boleh dikunjungi oleh rakyat pelbagai kaum. Menurut Laporan Tahunan Perbadanan Perpustakaan Awam Selangor pada tahun 2007, terdapat 930,000 buku dipinjam. Bandingkan angka ini dengan bilangan penduduk di Selangor yang mencecah 5 juta, ini bermakna rakyat Selangor hanya membaca 0.18 buku setiap tahun. Bagaimana kita boleh mengelar kita sebagai negeri maju jika rakyat kita kurang membaca? Oleh itu saya ingin mencadangkan supaya dijadikan Tahun 2010 ini sebagai Tahun Membaca Selangor dan kita mengiatkan budaya membaca di seluruh negeri Selangor. Kita boleh menjemput penerbit-penerbit, pengedar-pengedar atau penulis-penulis buku untuk bersama-sama dengan kerajaan kerajaan negeri Selangor untuk membangunkan budaya membaca ini di Selangor. Saya memberi sokongan penuh kepada program-program seperti Pesta Buku tetapi saya berpendapat ianya tidak harus tertumpu di sekitar Shah Alam sahaja tetapi perlu diperluaskan ke tempat-tempat yang lain seperti Klang, Petaling Jaya, Ampang Jaya, Bangi dan Sekinchan. 3. Kakitangan awam – meminta kerajaan mempertimbangkan untuk mengambil kakitangan-kakitangan kontrak yang telah berkhidmat lebih daripada 5 tahun atau 10 tahun sebagai kakitangan kekal. Saya juga bercadang supaya temuduga terbuka diadakan untuk perlantikan ke jawatan-jawatan tinggi seperti Ketua Jabatan, Setiausaha dan Datuk Bandar/YDP supaya kita dapat menyerap pakar-pakar dari luar untuk berkhidmat di bawah kerajaan Selangor. 4. Perlantikan kontraktor-kontraktor oleh kerajaan negeri Selangor perlu lebih telus dan lebih terbuka tanpa mengira kaum dan agama. Tarikh tamat pendaftaran juga perlu ditetapkan supaya mereka yang dilantik ini boleh menawarkan perkhidmatan mereka dengan kos yang munasabah seawal yang mungkin. Memandangkan kerajaan Persekutuan telah menghapuskan syarat ekuiti Bumiputera sebanyak 30% untuk syarikat-syarikat yang disenaraikan di BSKL, maka saya juga mencadangkan kepada kerajaan Selangor untuk mengambil syarikat-syarikat bukan Bumiputera untuk berurusniaga dengan kerajaan Selangor. 5. Kerajaan negeri juga perlu lebih berhati-hati dalam pemberian tanah kepada persatuan-persatuan tertentu. Kerajaan perlu menetapkan satu proses saringan dan pemantauan tentang penggunaan tanah ini agar ianya tidak disalahgunakan untuk memperkayakan individu-individu tertentu seperti apa yang berlaku dalam skandal PKFZ, di mana tanah yang begitu luas, iaitu sebanyak 1000 ekar diberi kepada Koperasi Pembangunan Pulau Lumu KPPL dan KPPL menjual balik tanak itu kepada KDSB dan seterusnya LPK untuk dibangunkan projek PKFZ. Alangkah sayangnya tanah kerajaan yang begitu bernilai diberi kepada sebuah koperasi dengan tujuan untuk membantu koperasi itu, tetapi tanah itu telah digunakan untuk mengaut keuntungan cepat. 6. Pelaburan – apakah corak pelaburan yang kita ingin menarik? Adakah ia industri yang berasaskan teknologi hijau, industri makanan halal dan yang berasaskan pertanian. Satu soul-searching exercise perlu dijalankan untuk menjenamakan Selangor sebagai pusat pelaburan asing di rantau Asia Tenggara. ADUN Sungai Panjang menuduhkan bahawa Selangor dipintas oleh Sarawak. Apa saya faham ialah sebab mengapa Sarawak dipintas Selangor ialah Sarawak mempunyai satu projek Peleburan Aluminium di Similajau, Sarawak, Projek ini adalah satu projek usahasama antara CMS Sdn. Bhd. dengan Rio Tinto dari Australia. Saiz pelaburannya ialah RM5.3bilion. Memang dengan pelaburan yang sebegini besar, Sarawak dapat memintas Selangor tetapi harus diingatkan juga bahawa industri peleburan aluminium ini merupakan satu industri yang tidak mesra alam sekitar kerana ianya memerlukan tenaga elektrik yang banyak. Oleh kerana terhadap surplus bekalan tenaga elektrik daripada stesen janakuasa Bakun, maka kerajaan Sarawak bermati-matian untuk mencari pelaburan asing untuk menghadamkan surplus tenaga elektrik ini. Bagi saya, ini bukan model pelaburan yang diperlukan di Selangor. 7. Prestasi Tourism Selangor dalam mempromosikan sektor pelancongan di Selangor – Beberapa lawatan ke Singapura oleh PBT yang dianjurkan oleh Tourism Selangor Sdn. Bhd. tidak dirancang dengan rapi dan pulangan yang diperolehi daripada lawatan ini adalah rendah dan saya meminta Exco yang berkenaan untuk memantau perkara ini dengan betul-betul. Saya meminta supaya satu senarai lawatan rasmi PBT dan kerajaan Selangor yang dianjurkan untuk setu tahun yang lalu oleh Tourism Selangor Sdn. Bhd. 8. Bandar Selamat – mencadangkan agar ditubuhkan satu lagi jawatankuasa di bawah PBT ialah Jawatankuasa Bandar Selamat untuk menyelaras segala perkara berhubungan dengan pencegahan jenayah melalui perancangan Bandar yang lebih bersepadu. Buat masa sekarang ianya hanya merupakan satu jawatankuasa Ad-Hoc di peringkat PBT sahaja. 9. Sejumlah RM44.9 juta telah diperuntukkan untuk Rancangan Mencegah Banjir di bawah Jabatan Pengairan dan Saliran Selangor untuk tahun 2009 dan sekarang dimaklumkan pula JPS ingin menambah peruntukan sebanyak RM7juta. Apabila diperhatikan peruntukan tambahan ini, peruntukan RM7 juta ini adalah untuk menampung emolumen dan bayaran pekerja, saya berpendapat ini harus dielakkan kerana kerja-kerja pencegahan bajir seperti mendalamkan sungai adalah kerja-kerja yang tidak boleh dilengah-lengahkan lagi. Saya ingat seharusnya wang ini sewajarnya digunakan untuk menjalankan kerja-kerja pencegahan banjir sebagai priority. 10. Saya juga meminta kerajaan supaya memantau betul-betul projek penyaluran air dari Pahang ke Selangor supaya air yang dibekalkan itu tidak akan dicemari sianida dan unsur-unsur logam berat yang lain kerana saya difahamkan tapak tadahan air di Pahang itu terletak berdekatan dengan tapak lombong emas yang menggunakan sianida untuk melombong emas. 11. ADUN Sungai Panjang menuduh kerajaan negeri Selangor membuat perjanjian dengan sebuah syarikat kroni untuk mengembangkan internet jalur lebar di Selangor. ADUN Sungai Panjang menuduh syarikat ini tidak mempunyai lessen WiMAX oleh SKMM. Saya memang mengaku syarikat ini tidak mempunyai lesen WiMAX kerana teknologi yang digunakan pun bukan WiMAX. Teknologinya ialah HyWIN iaitu satu teknologi yang mengabungkan WiFi dengan WiMAX untuk perkhidmatan dan kelajuan internet jalur lebar yang lebih stabil. Oleh itu, tuduhan-tuduhan yang dilemparkan oleh Sungai Panjang adalah tidak berasas malahan memesongkan dewan. 1. Pindaan terhadap garis panduan perancangan bandar dan desa yang sedia ada, khususnya perkara-perkara yang jelas sudah ketinggalan zaman, contohnya penyediaan tempat letak kereta di kawasan perumahan berbilang tingkat (strata) yang lebih banyak. a. Rizab tanah pemancar gelombang elektromagnet syarikat-syarikat telekomunikasi agar isu-isu pemasangan menara base-station dapat diselesaikan untuk projek perumahan yang akan datang. b. Menetapkan supaya sesuatu projek perumahan/pembangunan perlu dilengkapi dengan talian telefon dan talian fibre optic untuk membantu memecukan penggunaan internet jalur lebar di Selangor. c. Rizab tanah untuk pemasangan CCTV sejajar dengan matlamat ke arah bandar selamat. 3. Pewartaan Draf Rancangan Tempatan Petaling Jaya II yang masing belum diputuskan sehingga sekarang walaupun beberapa isu besar telah dibangkitkan dalam sesi pendengaran awam. Sehingga sekarang, saya masih belum mengetahui sama ada sebarang mesyuarat teknikal atau tindakan telah diambil oleh Jabatan Perancangan Bandar dan Desa (JPBD) walaupun JPBD telah mengemukakan jawapan bertulis terhadap cadangan-cadangan yang saya bangkitkan dalam sidang DUN yang lalu. • Apakah status Perbadanan Adat Melayu dan Warisan Selangor sekarang selepas penubuhannya pada sidang DUN yang lepas? • Apakah perkembangan-perkembangan terbaru pusat-pusat kebudayaan Tionghua, Melayu dan India yang bakal ditubuhkan, khususnya Pusat Kebudayaan Tionghua? • Ucapan syabas kepada Exco Perumahan untuk menwujudkan Petugas COB untuk membantu menyelesaikan masalah perumahan bertingkat. Pada masa yang sama, saya tidak bersetuju dengan cadangan Exco Perumahan untuk membeli lot rumah bumiputera kerana ianya tidak akan membantu menyelesaikan masalah rakyat dan bumiputera. Apa yang diperlukan ialah rumah mampu milik yang diperlukan bukan sahaja golongan bumiputera tetapi juga masyarakat bukan bumiputera yang tidak seberapa berada. Dengan itu, saya memohon menyokong.